The spark that gives life to any internal combustion engine comes from its Spark Plug. Spark plugs are the most important element in the car ability’s to run and make power. Without the spark plug, the car won’t run. So what are Spark Plugs? Let’s explore a little deeper in the subject and understand about Spark Plug. A Spark Plug has two primary functions. The energy contained in the fuel is converted into dynamic energy in the engine by spark plugs. This is done when lighting a spark which sets off a small explosion in each cylinder, making the pistons push into the crank, thus making it rotate and creating the combustion which actually runs the engine. 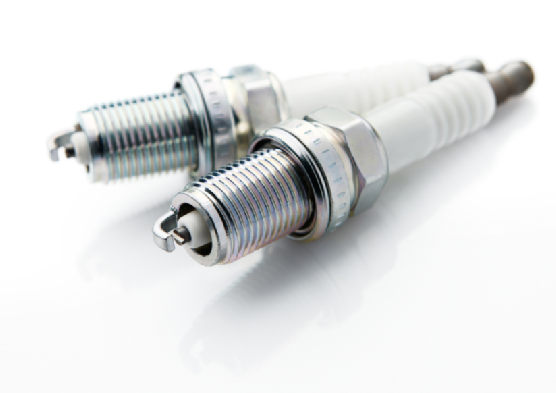 Normally the electrode on spark plug wears down because of the use over a period of time. It becomes so worn out that it does not create a much electric spark which eventually has an effect on the engine operation. When spark reaches old age they have already spent thousands of miles withstanding abuse, most extreme temperatures and conditions. That’s where the importance of spark plug material comes into play. Usually automakers recommend to replace the spark plug roughly every 30,000 Km (It varies from one manufacturer to another). However the actual replacement will vary depending on other factors. Rattling, pinging or “knock”-like noises: If there noises from the force of the pistons and combustion are not working properly it may be because of misfiring of the spark plug. The constant rattling or knocking sounds are because of spark plug misfiring. Hard vehicle start: The spark plug may not be working correctly if there are trouble starting or it feels disjointed and jerky and this can lead to misfires and bad performance. Lack of acceleration: If the vehicle is accelerating poorly or if it feels that vehicles is not responding when put your foot down then this may be because of spark plug is not functioning 100%, your vehicle performance will be poor, and you’ll experience a sluggish and fuel-wasting drive.